Everest opens in Australian cinemas on September 17 and is distributed by Universal Pictures. Opens in the United States on September 24 and the United Kingdom September 18. Everest is an incredibly tense and brutally honest film based on horrifying true events that took place at one of the world's most dangerous and beautiful locations, which does not disappoint on any level. The world's highest peak, Mount Everest has always been the source of fascination and wonder for mankind and to many it has also symbolised achievement. The chance for adventure seekers all around the world to summit Everest has grown to be a highly marketable business and in May 1996, the mountain's base camp was at capacity with five teams set to summit on the 10th. The mountain proved too much for many of the climbers to make it to the top, but just after many of the participants did summit a dangerous blizzard hit the area. What resulted was the darkest day in Everest's history to date. Based on the memoirs and accounts of the survivors of the tragedy, Everest has a magnificent way of telling a story whilst building and maintaining tension. Films based on true events tend to have a challenge developing a level of suspense when their audience is aware of the incident and it's outcome. Everest avoids this stigma as the events which took place in May 1996 occurred in one of the world's most dangerous places and allow the dramatic story to have an action/adventure edge to it which heightens the opportunity for suspense. Much of the tension also comes from the fact that this film is based on true events so taps into people's worst fears. 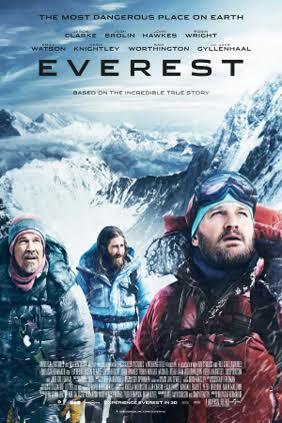 Everest does not attempt to sugar coat the experience of climbing the world's highest mountain. The attempt to summit does not only involve a physical strain on the body due to the climbing itself, but also the hazards involved with the body at high altitudes. There are some rather confronting scenes which involve how the body was not meant to withstand the altitude at which Mount Everest stands. The screenplay gives one the understanding of why people choose to climb the mountain, but also why others would never attempt it. The majority of the screenplay is aligned with fact and stays true to the accounts of those involved who survived. However, there are several scenes involving those who didn't survive which are obviously fictionalized and imagined for dramatic effect as there is no way one could know exactly how these certain instances took place. While Everest is considered one of the most dangerous places on Earth, it is also one of the most stunning which is a major reason why it is a another major draw for adventure seekers. The mountain and it's section of the Himalayas in Nepal is captured to perfection on camera in Everest. The aesthetics of the film allow one to feel as though they are on the mountain themselves feeling the extreme cold, but also marvelling at it's beauty. The cinematography by Salvatore Totino is exquisite and the editing by Mick Audsley fantastic. The multi-protagonist nature of the film allows for well-rounded characters to be developed and wonderful performances to be created. 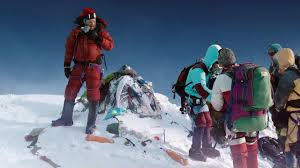 It is with the attention paid to each of the characters and their motives that allow one the understand the fascination of Mount Everest before judging people for putting their lives in danger. Jason Clarke give a solid and convincing performance as Rob Hall, the leader of the Adventure Consultants expedition team. While Jake Gyllenhaal, who plays the quirky guide for the Mountain Madness crew Scott Fischer, is fine, but it feels as though his character wasn't given a great deal to work with. Josh Brolin gives perhaps the strongest performance of the climbers on the mountain as Beck Weathers. His character develops throughout the film from a cocky adrenalin seeker to being vulnerable under the power of the mountain. As Rob Hall's wife, Jan, Keira Knightley is also very good and makes the most of her limited screen time as her character waits at home for her beloved husband to return. Everest is a particularly strong hybrid of drama and adventure that avoids the general pitfalls of films based on real life events. It's suspenseful and terrifying nature is met with breathtakingly beautiful images and allows for an experience that is devastating, but intriguing.